That is the UCR-CoP meeting’s theme for our November meeting where members of UCR-CoP gathered together to hear and discuss project results and experiences related to changing flood risks in Peri-Urban areas as well as urban planning and development in some cities of Vietnam, and to participate in the Soft Launch of The Asian Cities Climate Change Resilience Network (ACCCRN) Regional Network in Vietnam. The event was organized at Asian Development Bank (ADB) in Hanoi on November 11, 2015, with the participation of representatives from Department of Construction of Thua Thien Hue Province, Hue Planning Institute; Department of Construction of Da Nang city, Climate Change Coordination Office of Da Nang city; universities; agencies of the Ministry of Construction NGOs; ACCCRN network; and consulting agencies in Vietnam. 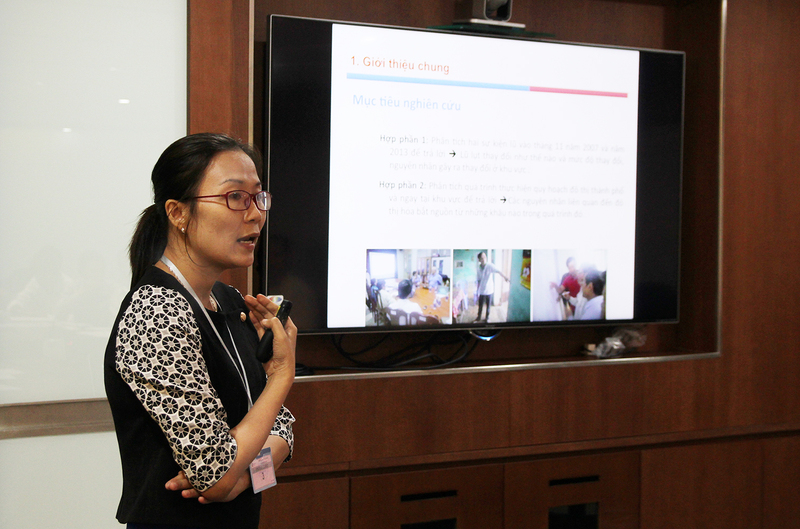 Dr. Dang Minh Nam has shared the outcomes of the project Development of Peri-Urban Regions of Hue City, namely the An Van Duong City (AVD) – the case study on urban development in low-lying region. Accordingly, causes of increased flooding in this region and recommended solutions have been provided by this project. In recent times, flooding in Hue has been reduced to some extent thanks to the two upstream reservoirs. However, Mr. Nam emphasized that it is necessary to consider sudden changes/shocks and the scenarios of appropriate reservoir operation, especially in the process of urban planning. In addition, Mr Nam said that HPI has developed a Tool of Climate change under the support of ISET and Cascadia. This tool has helped leaders and policy-makers deliver proper decisions in response to scenarios and, currently, been used and mainstreamed in provincial and local planning projects. Ms. Ha shared two main research findings related to climate change and the information on the research sites in Da Nang: Hoa Tien, Hoa Chau anh Hoa Xuan with conclusions and recommendations to related stakeholders. 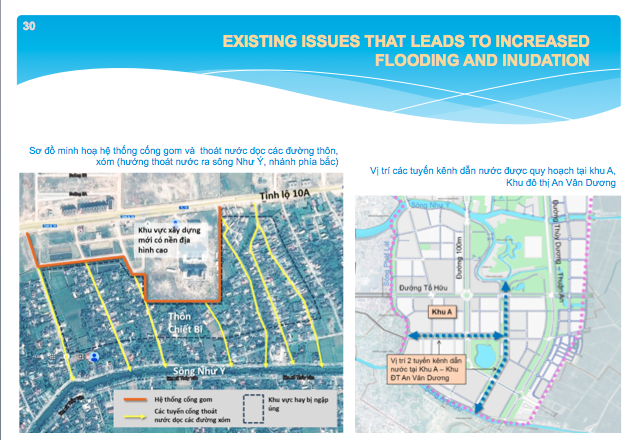 She highlighted three main causes of flooding: (1) the rise of new traffic roads (currently, Hoa Tien and Hoa Chau have at least two new roads according to the city planning to 2020); (2) the operation of upstream reservoirs that is out of control of Da Nang; and (3) the increased elevation of some particular location, especially in the upstream areas. There are some specific recommendations to the Ministry and Central levels that highlight the necessity of having regional planning to balance development of neighbouring cities (such as Da nang and Quang Nam). The management of urban planning need to be intensified and made from the ministry and central level to reduce future risks. 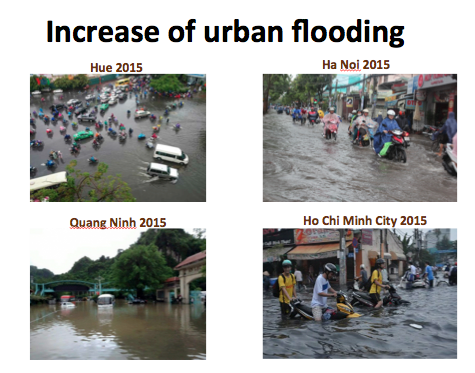 It is clear that urban flooding is largely caused by human decision. Filling the land will only relocate problems, change water depth and flow in unpredictable ways so residents are surprised when next flood happen because it different from historical flood and their response mechanisms will no longer work. Without information about plan, expected investment, etc, they try to solve the problem themselves which is costly and will disrupt the drainage system, and the poor will further under water. Dr. Stephen Tyler also mentioned the problem of inconsistent implementation of urban plan such as a lot of effort in Vietnam come to develop plan, and then will be modified to accommodate subsequent investors; long term program of urban growth doesn’t implement in sequence that it designs for; initial phase of infrastructure investment is typical road which is costly and afterward, the local government can’t afford to build drainage; new urban areas are used as promotional device rather than to serve in a strategic and sequential way. Dr. Stephen Tyler also shared several planning and infrastructure responses to the mentioned problems such as create more space for water, construction plans deals with impacts from surrounding area, better public engagement, etc. Climate Change Adaptation: Integrated Water Management in Urban Development in 3 provinces (Ha Tinh, Ninh Thuan, Binh Thuan). The overall program plan is to undertake couple of years works of investigation, looking into issues of flooding, climate change downscaling, hydrology modeling, urban system, urban water management. The intention was using information from other studies in climate change impact to inform a number of things (update climate action plan, planning system) and to use modeling information to inform planners, DARD, DONRE and related stakeholders. 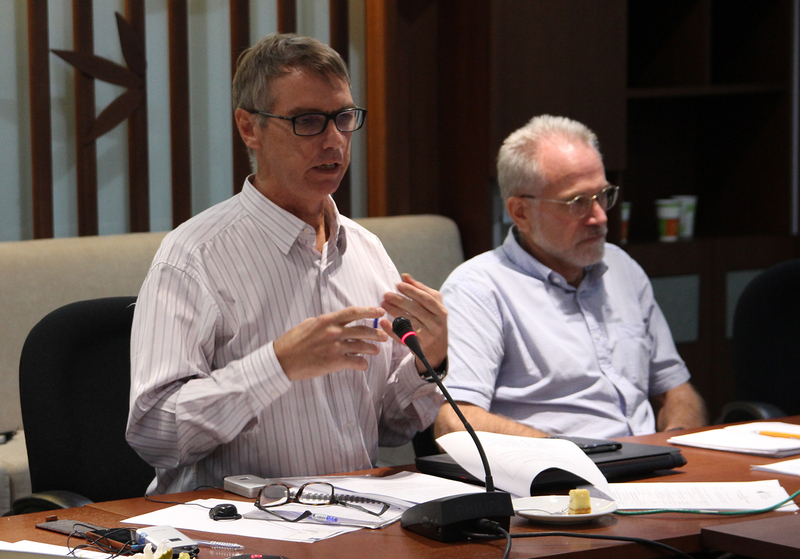 Introduction to the The Asian Cities Climate Change Resilience Network (ACCCRN) Regional Network – Mr. Jim Jarvie, ACCCRN network, Mercy Corps Indonesia. The summary of the presentation for the Lanch of ACCCRN network can be seen here. 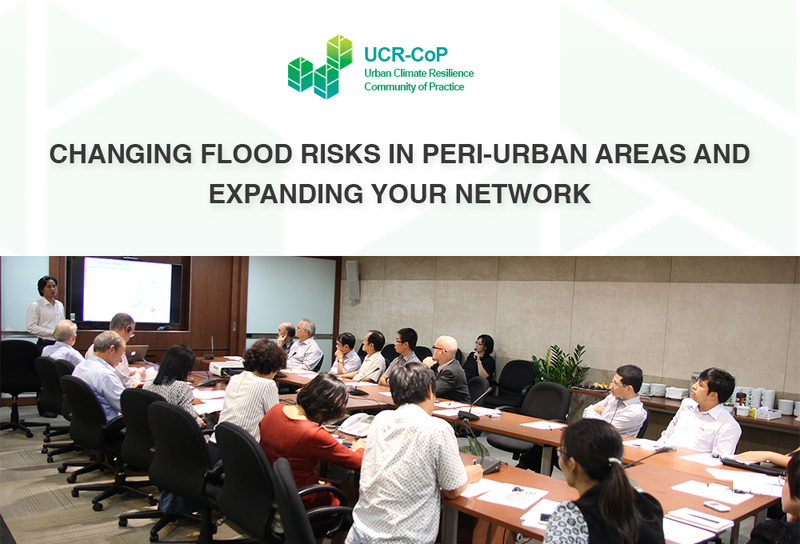 ACCCR is the regional network that supports individual practitioners, institutions and country networks like UCR-CoP for climate change resilience across Asia. To sign up as members of this network, please visit acccrn.net. For more detailed information of the workshop presentations please refer to the Events page. All UCR-CoP members will receive the detailed notes of workshop contents and related discussions. Many thanks for participating and sharing at the workshop and we hope to see you soon at our next meeting. This entry was posted in Climate Change, English / Tiếng Anh, flood management, urban planning, Urban resilience, Working Group Meeting and tagged Bien doi khi hau, climate change, Da Nang, flooding, Hue, ISET, peri-urban, Periurban, So Xay Dung, urban resilience. Bookmark the permalink.